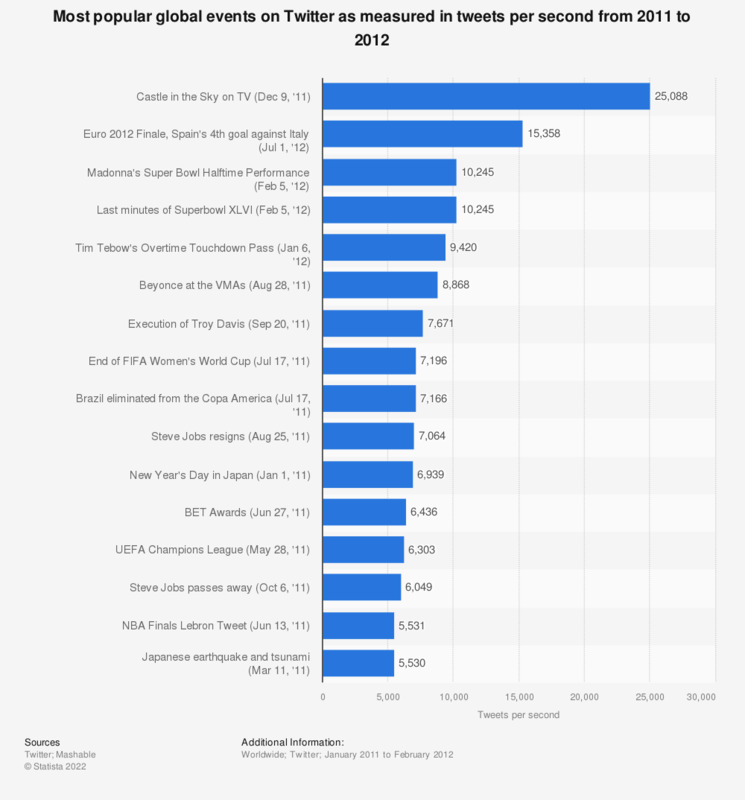 This statistic shows the most popular global events on Twitter, measured in amount of tweets per second generated between January 2011 and February 2012. On March 11, 2011, the earthquake and tsunami in Japan generated 5,530 tweets per second. In December 2011, a television airing of the 1986 animated Studio Ghibli film Castle in the Sky set the record of being the most-tweeted-about event with 25,088 tweets per second. Furthermore, during the 2012 UEFA European Football Championship finale between Spain and Italy, messages spiked at 13,358 tweets per second during the fourth goal for Spain. Information regarding the UEFA Euro 2012 Final are Twitter's blog.